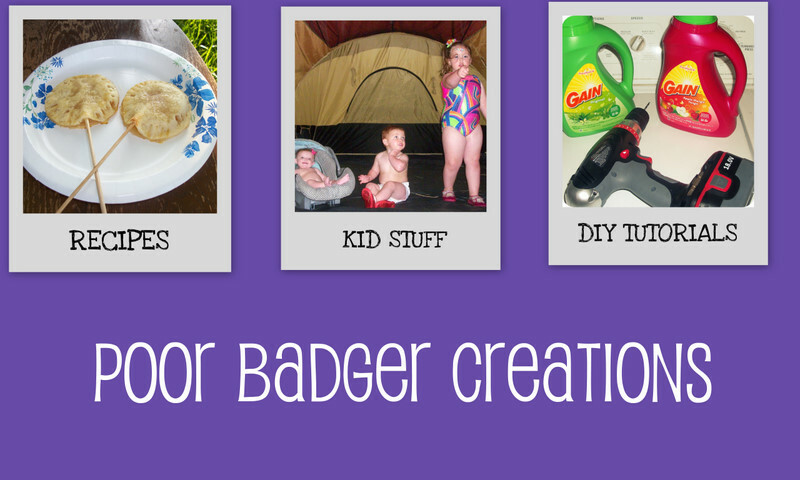 Poor Badger Creations: Meet our family elf; Alabaster Snowball! 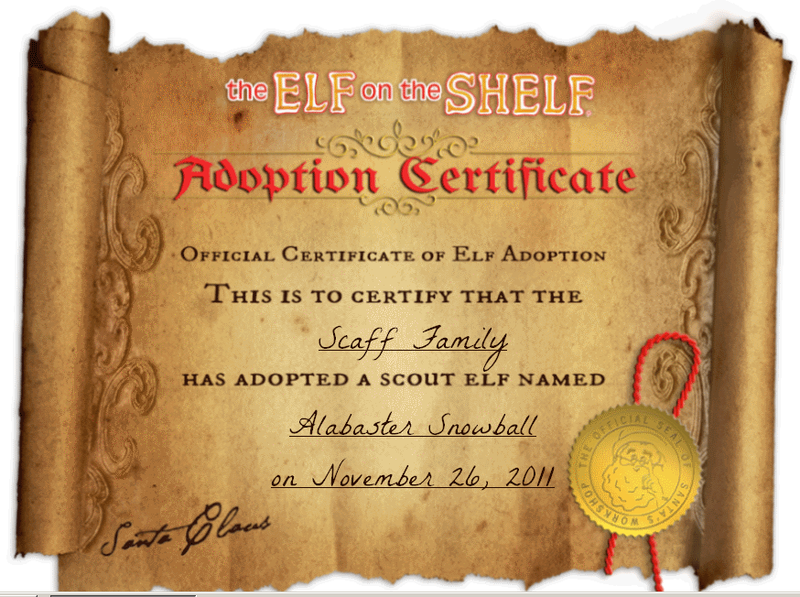 Meet our family elf; Alabaster Snowball! Oh how my kids LOVE this new Christmas tradition called Elf on the shelf. I wanted to blog about this in time for you to adopt your own family Elf. Christmas is about celebrating the birth of our savior, but I really feel strongly about incorporating fun family traditions that foster imagination and family bonding. First you need to go adopt your own Elf. These are pricey, around $30 a kit. But you only have to buy them once and thankfully we got ours on Black Friday with a 10% discount and a $5 off coupon. Book stores, pharmacies, Target, and Hallmark stores carry them. They come in this cute box that you save each year to announce the coming of your family Elf! Your kit comes with a story book you can read to your kids explaining the story of the scout elf. In a nut shell the second you first get your elf home you must name them, that is how they get their magic. Then read you kids the story and let the magic happen. Santa needs help figuring out what kids are good or bad, so these scout elves watch your family. Once an elf joins the family, they are bonded for life. Once the holidays begin the elf you had last year reappears at your home with his book and he/she begins taking note of the kids. Every night once your kids go to sleep, your elf uses its magic to fly to the North Pole and tell Santa all the good things and bad things they did for the day. Then your elf zooms back home before morning and hides in silly places. It becomes a game to see who can find the elf first and see what silly thing your elf did. Only two elf laws; elves can only listen to you. They will take note of what you want for Christmas and relay the message to Santa, but they can not talk back. The second is VERY important; if you touch the elf it will lose its magic. No more flying to Santa. Proudly I can say that after a month, no Scaff kid has touched our Alabaster. 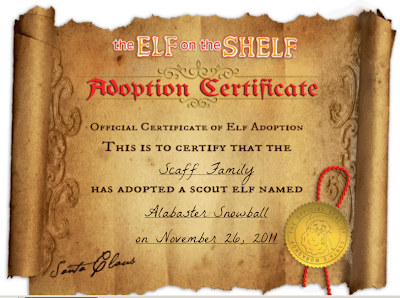 Our Elf is Alabaster Snowball, he is a Southern Gentlemen with a pension for the ponies. He enjoys the formalities of a polite and proper phone conversation but also is frisky and likes to do some very wonky things. One morning we awoke to this bit of cheekiness. We blocked the number. We think this was a bit of elf revenge. On Christmas Eve night, your elf leaves your family for the year. He joins Santa and his buddies but will return promptly once the Christmas season comes back around. We love that our family has adopted this proper little trouble maker. Alabaster Snowball has made this month so fun and it will be sad when he leaves. There is a website that lets you share the stories and pics of your elf; elfontheshelf.com. Thanks for reading! We hope you have enjoyed Alabaster as much as we do. Nice weblog here! Also your web site lots up fast! What host are you the use of? Can I am getting your affiliate link to your host? Poor badgers across the globe.